Remember that neat movie from 1970, The Magic Christian, which starred Peter Sellers and Ringo Starr and was a cutting farce on the lengths people would go to to get money? And remember that film’s nifty theme song, “Come and Get It”, which sounded like the Beatles but was actually a little-known band from Swansea, Wales called Badfinger? And remember that group’s other big ’70s hits “No Matter What”, “Day After Day”, and “Baby Blue”? Well, whether you can recall all that stuff or not, the opportunity to have your memory well jogged by a dose of ’70s British power-pop will arise this Tuesday and Wednesday (December 15 and 16), when the latest incarnation of Badfinger plays the Commodore. Joey Molland, the lead singer and sole original member of the band, called the Straight from Minnesota last week and explained what it was like to start up a band in the shadow of the Fab Four. “Well we did do the same thing pretty much,” he admits. “I mean, John Lennon’s’ been quoted as saying ‘If you want to see the Beatles, go see Badfinger.’ I don’t think we were actually copying them, but they were obviously a big influence on us. Badfinger’s first connection with the Beatles came after they sent three demo tapes to Apple Records, whereupon George Harrison signed them to the label and took them under his wing. Then Paul McCartney gave them a nice little shove by writing “Come and Get It” for them. 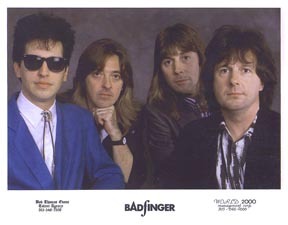 Although Badfinger soon had their own hits, and top-selling albums (they’ve sold 14 million worldwide), the initial help the Beatles gave them was repaid when Badfinger members played on the Beatles’ solo albums. They played virtually all the acoustic guitars on Harrison’s All Things Must Pass and did the guitar work on two tracks from John Lennon’s Imagine LP. Molland and his bandmates also took part in the forerunner of Bob Geldof’s Live Aid, Harrison’s Concert for Bangladesh. According to Joey, that was a once-in-a-lifetime show. The group plans to go into the studio in February to make its first album since 1981’s Say No More. They’ve got a deal with a new label out of Florida called World Records, with none other than ace knob-twiddler Jack Douglas set up as a producer. It’ll be Douglas’s first album project since Lennon’s Double Fantasy. Though things are looking good for Molland’s career these days, Badfinger has not gotten by without its share of tragedies. Original singer/guitarist Pete Ham committed suicide in 1975, and then another founding member, bassist Tom Evans, did the same in ’82. Molland’s good friend Mal Evans, the Beatles’ road manager, was shot by L.A. police when he was there to help Joey on the Natural Gas project. So it hasn’t all been wine, women, and song. But Molland has come through it all in one piece.